A Green tea recipe can deliver taste, aroma and many health benefits. Having converted from drinking black tea, I began experimenting and eventually found a green tea recipe to my taste. It is a Japanese GreenTea recipe for creating a super smoothie drink. 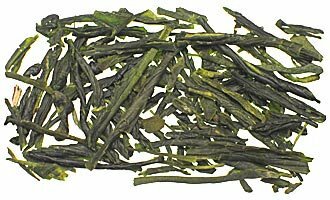 Use Japanese-Sencha-Green-Tea leaves for the best result. Steep half a teaspoonful of tea into half a cup of water heated to 180F degrees and leave for 3 minutes to cool. Blend 1 cup of crushed ice, half a banana and half a cup of pineapple until smooth. Add the half cup of tea at the last minute. This little indulgence makes a very refreshing (approximately 100 calories only) breakfast drink. You can use Jasmine tea to vary the flavour and other fruits such as Mango or Peach to vary the recipe. Some people use it in powder form or tea bags instead of leaves. Surprisingly to me "Green Tea perfume" has been launched by Elizabeth Arden. It is described as refreshing, intoxicating and sophisticated, part of a larger range including bath oil, salts, lotion and soap. It just goes to show that this amazing plant has uses that even now are multiplying as its popularity and people’s knowledge grows. You've read our recipe, but have you tried it? Your recipe may well appeal to more visitors than ours and we love to spread happiness in whatever shape or form. By the way, if you tried our recipe, did you like it? Tell us below.